Hatch is a village in Doña Ana County, New Mexico. It is part of the Las Cruces Metropolitan Statistical Area. The town is experiencing moderate growth. Hatch was originally settled as Santa Barbara in 1851, however Apache raids drove the farmers away until 1853 when the nearby Fort Thorn was established. When Fort Thorn closed in 1860, the town had to be abandoned again. It was not until 1875 that it was re-occupied and at that time it was re-named for Indian fighter Edward Hatch, who was then commander of the New Mexico Military District. 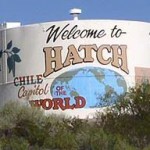 Hatch enjoys the distinction of being the home of “The World’s Best chili pepper”. Hatch chile is best prepared by roasting over an open flame. Each year during chile season, dozens of chile vendors can be found lining the streets of Hatch roasting the local chile. The Hatch Chile Festival is an annual event that occurs each Labor Day. This event attracts people world wide to a place known as the chile capital of the world. The small town has accommodated up to 30,000 people for this event. This small farming community is known world wide for raising very good chile. Other crops such as onions, cotton, and corn are also raised there. Irrigation of local farms is accomplished by water wells as well as irrigation ditches which divert water from the Rio Grande and two lakes approximately 20 miles north of Hatch named Caballo (Spanish for “horse”) and Elephant Butte Reservoir (named after a rock formation in the middle of the lake that looks similar to an elephant). Hatch is 40 miles north of Las Cruces, New Mexico on Interstate 25. According to the United States Census Bureau, the village has a total area of 3.1 square miles (8.0 km²), all of it land. The village is located just off Interstate 25 about 40 miles northwest of Las Cruces, NM and approximately 80 miles northwest of El Paso, TX. Hatch and the surrounding area (Doña Ana County) was hard hit by flooding in Summer 2006. The area was declared a disaster and FEMA established a Disaster Recovery Center in the city. Wikipedia contributors. “Hatch, New Mexico.” Wikipedia, The Free Encyclopedia. Wikipedia, The Free Encyclopedia, 11 Aug. 2010. Web. 12 Aug. 2010.